Hello friends, Gin wife here to talk to you about another delicious thing you can do in the kitchen with gin. Besides drink it, of course. Gin-berry jam! Which, come to think of it, you can put in a Gin Jam Cocktail. So you can drink this, too. Or put it on toast. Or both. No judgement. Working with sugar is always tricky – break out the pants and long sleeves for this. Now, this berry gin jam recipe will not preserve your jam on the shelf indefinitely. This will definitely have to go into the fridge when you are done. 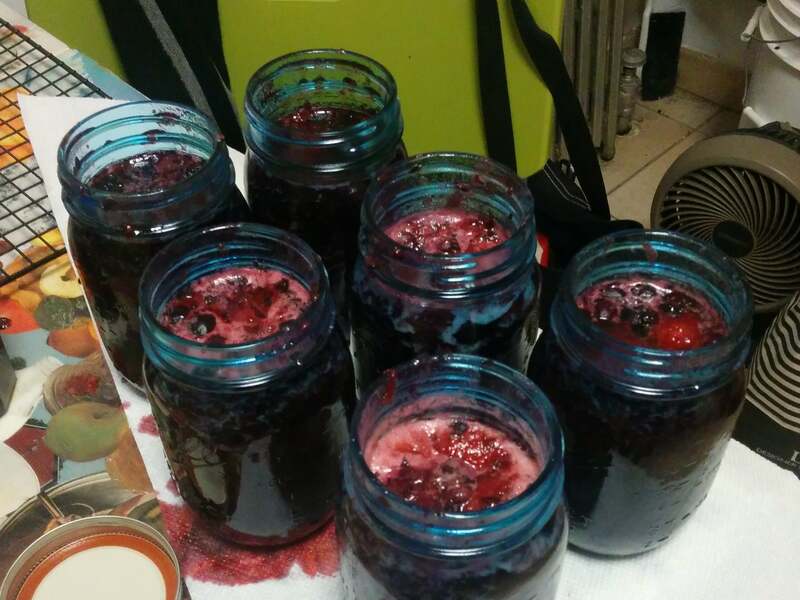 If you want to have jam that will last for months on the shelf, I’d look into how you sterilize and boil jam jars – plenty of resources out there! Also, you add gin to boiling liquid, but assume there will always be a trace amount of alcohol. 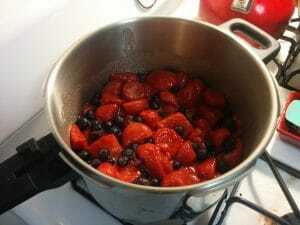 3 pounds fresh, clean berries – I used blackberry, strawberry, and blueberry. 7 and a half cups of sugar (about 4 pounds, measure it out!) – Yes, you need this much. Don’t try with a sugar substitute, it will not set in the same way. There are ways to make sugar-free and lo-sugar jam, but this is not one of them. 6 ounces liquid pectin – I bought mine on Amazon, but any decent grocery ought to have them. DO NOT buy gelatin. Trust me. 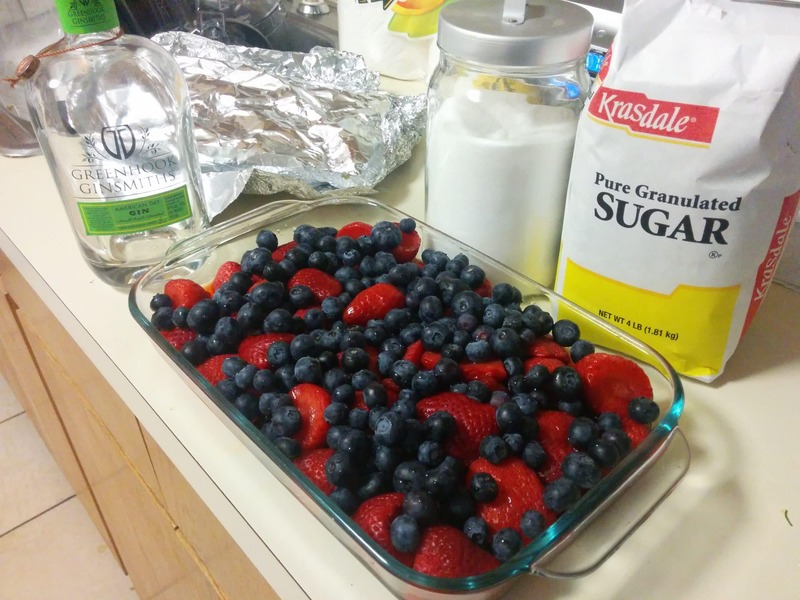 1/4 cup gin – Go with something you’d think would taste nice with berries. Cumin gin is lovely and all, but maybe not with berries and sugar, yeah? A deep, big pot. Not quite a soup pot, but big. And deep. Make sure the jam jars are clean. We’re not preserving for the shelf, so they don’t have to be sterile, but you know. Wash them up. And the lids! Wash the fruit. Cut off any stems, leaves, etc. Put the whole 7 and a half cups of sugar into the pot. Add the berries and lemon juice. Squish the berries a little bit. Don’t be like me and forgot to do this until the very end. Squish them up so that jam will spread! Bring the sugary mixture to a boil for one minute. Add the gin, then add the pectin, and boil another minute. Splash some more gin after that minute. Let the hot mixture sit for a couple minutes. Skim any foam off the top. It won’t kill you, but it’s pretty flavorless. Once it starts to cool, set up the canning jars on the wire rack with plenty of paper towels underneath. Use the wide mouthed funnel and scoop the jam into the jars. Leave a bit of room at the top. This makes a lot of jam. I filled up 6-16oz jars plus a few more jars I had lying around as emergency overflow. Let jam cool and set. Keep in the fridge – should last a couple of months. Then eat! Sometimes I have some jam and think, wow this has a strong gin flavor. Sometimes, I don’t taste it as much – this might just be poor mixing on my part, or just the whim of the taste bud. I find the jam to have a delicate gin-note, with the non-juniper notes to be as present as the other flavor. Why, Gin Jam Gin Jam Cocktail, of course. 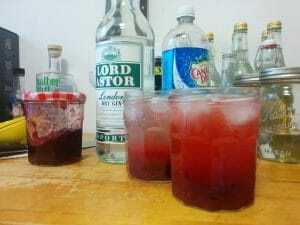 I used a “Classic Gin” (Lord Astor’s in this instance) to let the notes of the other gin (Greenhook) shine through! A double gin cocktail. Perfect. ← What is Balance in a gin?